Here at BBQ Smarts we typically focus on grilling and smoking, but we love pretty much any kind of outdoor cooking. Especially when pizza is involved! If you’re ready to take your homemade pizza to the next level – but not quite to the point of building a brick-and-mortar oven – then we’ve got you covered with this roundup. Whether you want something that replicates the real deal or a smaller, more portable option, we’ll help you find the best outdoor pizza oven on the market for your specific needs. 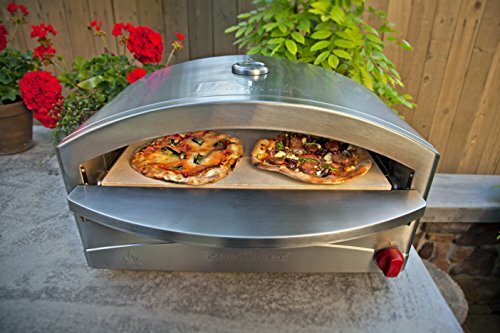 #1 Best Outdoor Pizza Oven! Our #1 outdoor pizza oven is the ilFornino Professional Series Wood Fired Pizza Oven. 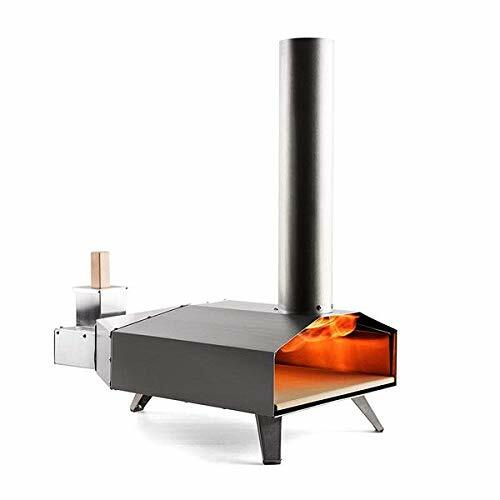 It has the size and construction quality of a traditional brick and mortar oven, with added mobility and a slick stainless steel finish. Coming in at our #2 spot, the Ooni 3 is an extremely popular model in the world of outdoor pizza ovens. It runs on energy-efficient wood pellets but can reach amazingly high temperatures in excess of 900° F.
Propane-powered and easy to clean, the Camp Chef Italia Artisan Pizza Oven offers mobility and a fast 15-minute pre-heat. 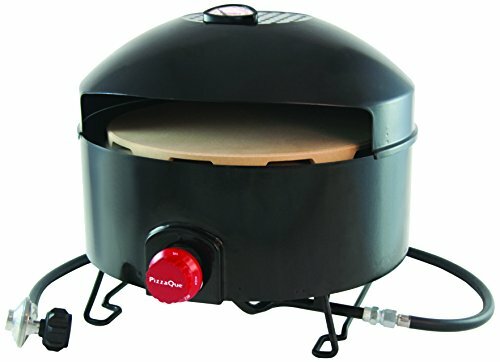 Best for beginners, the propane-powered PizzaCraft PizzaQue Pizza Oven offers a lightweight introduction to creating authentic pizza at home. Get all the wood-fired benefits with just your standard grill by using the Zenvida Grill Top Pizza Oven with Stone. To jump straight to the in-depth reviews of each pizza oven, click here. Large, traditional pizza ovens rely on wood logs/chunks as their fuel source, and for good reason – a wood-burning oven can reach astonishingly high temperatures (think 800°F and up! 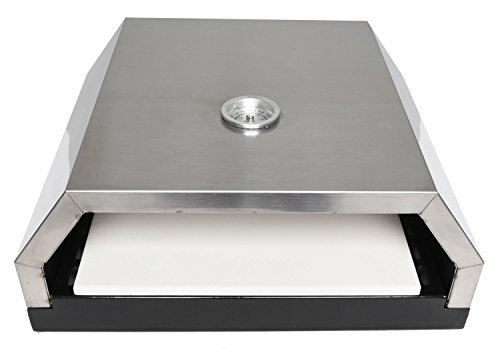 ), which allows for a quick and even cook time and a crispy crust on your pizza’s base. With that being said, newer outdoor pizza ovens have effectively introduced other fuel sources, such as propane and wood pellets. These are typically less messy and more efficient – and they can still reach astonishingly high temperatures. As with other outdoor cooking equipment, pizza ovens come in a variety of sizes and have different cooking capacities. Smaller ovens, better suited to patios and terraces, offer a more compact cooking experience and require less fuel, heating up to the correct cooking temperature more quickly. Larger ovens offer greater space for cooking and rotating foods, as well as more room to move and manipulate the fire and fuel for better heat distribution. If your outdoor space is limited or there’s a need for your pizza oven to be put into storage, be sure to note whether or not your chosen model is portable. Larger models can be very heavy, so check for wheels with locking mechanisms to keep your oven mobile for storage and secure when in use. Perhaps the most important aspect of a pizza oven is the ability to maintain high temperatures. For that reason, look for a fully-insulated exterior (hearth and dome). This will aid with heat retention and higher cooking temperatures as well as making sure that the outside of the dome is not a burn hazard for those using it. Our top pick, this ilFornino model is spacious, insulated, and mobile, making it perfectly suited for your backyard cooking. Boasting an impressive 1007 square inches of cook space, this oven can easily accommodate up to six smaller pizzas at one time. Weighing in at 280 pounds without the stand, this oven is certainly on the heavier side, but this is due to the high-gauge stainless steel dome, double-walled with 4 inches of insulation, as well as the 1.5 inches thick refractory stone flooring – the same kind of stone used in commercial ovens. Use of high-quality materials adds to the weight but also to the heat retention and even distribution, which allows this particular model to be ready for use in approximately 25-30 minutes, less than half the time of similar size ovens. Versatile, the ilFornino pizza oven can be used to bake, sear, and grill foods with the purchase of additional accessories. The door-mounted thermometer is accurate and easy to read, with temperatures recorded up to 900°F. Clean up is also made easy with the inclusion of an ash dump, located at the back of the oven. When used with the stand, the oven becomes mobile, featuring 4 heavy-duty casters with locking mechanisms. The stand also provides storage space for wood and other cooking accessories. The Ooni 3 (previously Uuni) is perhaps the most well known name on our list. Designed to be lightweight and mobile, this model has all the features of a larger oven condensed down – from the 0.4-inch thick cordierite stone floor, boosting heat retention significantly, to the heat-resistant stainless steel dome with insulated body. It should be noted that stainless steel is liable to fracturing at sub-zero temperatures, so this oven should be placed into storage or brought inside to avoid breakage. Perhaps most interestingly, the Ooni 3 runs on wood pellets, an environmentally sustainable fuel source which allows you to cook at higher temperatures and maintain heat in a stable way. Wood pellets are easy to clean up and allow this model to heat up to an impressive 932°F in just 10 minutes, reducing your wait time and cooking a 13-inch pizza in just 60 seconds. With 3 legs instead of 4, the Ooni 3 promises to be a more stable pizza oven, suitable for use on any surface and maximizing portability. The chimney click mechanism also allows for easy attachment and removal of the flue for quick storage and transportation. This model is adaptable when it comes to the fuel source and can be used with the compatible gas burner. Another potentially portable model, the Camp Chef pizza oven weighs in at 47 pounds and uses propane as a fuel source – this model can use both 1-lb. camping tanks and has a 5-foot adaptor hose for larger fuel tanks. With temperatures up to 700°F possible, this oven is ready to use in just 15 minutes, making it perfect for camping, tailgating, and cooking on the go. With a double-layered ceiling for enhanced heating dynamics and a cordierite pizza stone, this gas-powered pizza oven is designed to cook just like one of its wood-burning counterparts. Specially-designed burners recreate a more traditional pizza oven experience, enabling you to cook the perfect pizza every time. The built-in ignition and micro-adjust ventilation valves allow you to maintain accurate temperatures easily, with monitoring internal temperatures made simple with the built-in gauge. The stainless steel construction makes this pizza oven very easy to clean and the gas fuel source means no ash clean-up is required. Versatile, this oven can cook pizzas, bake bread, even grill steak – all depending on what you want it to do. It is worth noting that the door on the front of the oven is not hinged, but rather is removed completely to allow food to be placed inside. This process can let a lot of heat escape so it is advisable to rotate food inside the oven, especially pizzas, to ensure even heating. A basic model well-suited to those just beginning on their pizza-making journey, the PizzaQue is light and maneuverable, making it perfect for camping, tailgating, or adventuring of your choosing. At roughly 25 pounds, this model is easily transported by one person. Running on propane, this model can connect to a 1-lb. camping tank or a larger, 20-lb. tank by using the included adaptor hose. Operated with a control knob on the front, the PizzaQue has Low, Medium, and High settings, making gauging temperature a little imprecise. The built-in thermometer does monitor internal temperatures, but it is advisable to use additional gauges to ensure accuracy. Able to heat up to 700°F, the pre-heat only takes 15 minutes and is able to cook a pizza in about 6 minutes, providing it is turned halfway. This particular model does not include a pizza peel – one must be purchased separately. The stone is made from cordierite, which allows for even heat distribution on the cooking surface. The domed top is lined with an inner heat shield, bouncing heat back down onto the food as it cooks. As the material construction of this pizza oven is thinner than some others on this list, it is important to keep the oven shielded from adverse weather such as rain and wind, as this will interfere with the cooking temperature. If you have limited outdoor space and want to use your existing grill as a fuel source, consider the Zendiva Grill Top Pizza Oven. Super lightweight at only 11.6 pounds, this pizza oven is also extremely easy to use – just place on top of a charcoal or gas grill, pre-heat, and start cooking. A temperature gauge built into the top allows for accurate monitoring of internal temperatures. 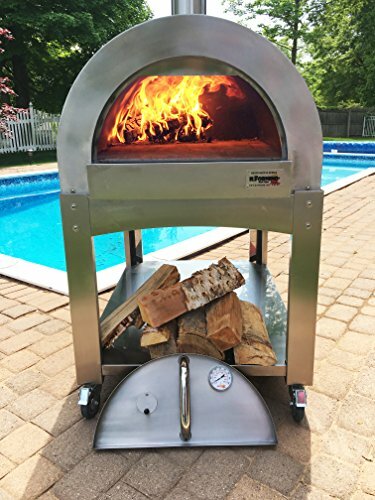 The stainless steel housing and cordierite ceramic stone are designed to mimic the workings of a wood-fired pizza oven, reflecting and distributing heat to ensure an even internal temperature. A versatile cooking implement, this pizza oven is able to cook meat, fish, and vegetables, as well as bake loaves of bread and pies. With handles on either side of the model, this oven is easy to move and carry. Keeping the temperature steady is also quite simple, as the oven will maintain at the same heat as your grill. It should be noted that the oven will heat more quickly when the grill lid is shut. As the stainless steel walls are not double insulated, the internal oven temperature can be affected by adverse weather. And if you want an even simpler approach to cooking pizza on your grill, check out our article on the best pizza stones for your grill. For a true, authentic wood-fired pizza experience, your best bet is to go for the ilFornino Professional Series Wood Fired Pizza Oven. It functions like a true brick and mortar pizza oven and will last a lifetime with proper maintenance. However, if the ilFornino model is too large for you, check out the Ooni 3, which conveniently runs on wood pellets. For portability and on-the-go pizza making, try the PizzaCraft PizzaQue or fire up the Camp Chef oven, which both run on propane. Lastly, if you want to go with the simplest approach, consider using your propane or charcoal grill as the heat source with the Zendiva Grill Top Pizza Oven. I hope our roundup helps you choose the best outdoor pizza oven for your home. If you have questions about any of these models or other comments, please let me know below!